On Sunday, June 17, Eastern American Diocesan vicar Bishop Nicholas of Manhattan celebrated Divine Liturgy in the Synodal Cathedral of the Sign in New York City. On this day, the Russian Orthodox Church commemorates the Synaxis of the Saints of Vologda, Novgorod, Belorussia, Pskov, and St. Petersburg. 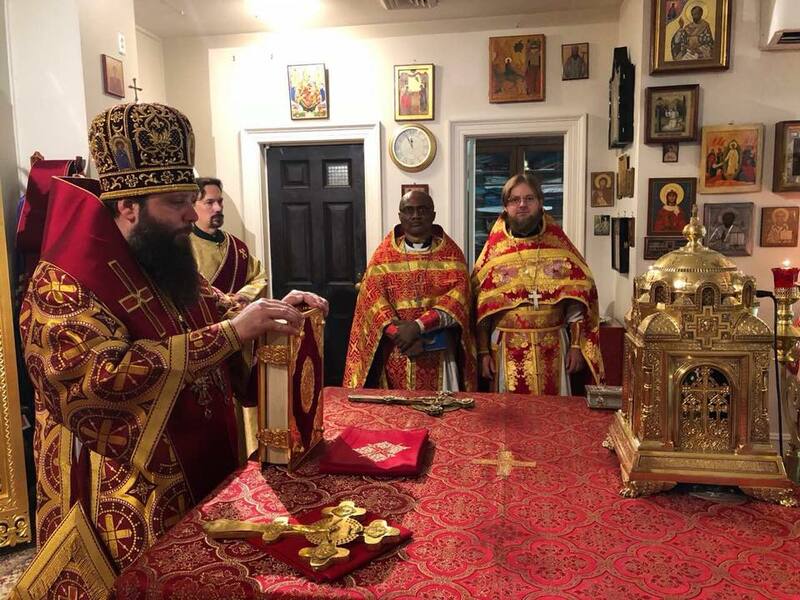 His Grace was co-served by cathedral clergy: senior priest Archpriest Andrei Sommer, Archpriest Edward Chervinsky, Hieromonk Tikhon (Gayfudinov; abbot of Holy Protection Skete in Buena, NJ), Protodeacon Nicolas Mohkoff, and Deacon Pavel Roudenko. Visiting the cathedral that day and concelebrating was a cleric of the Nigerian Diocese of the Patriarchate of Alexandria and student of St. Vladimir’s Seminary OCA in Crestwood, NY, Archimandrite Chrysostom (Onyekakeyah), as well as other visiting clergy. 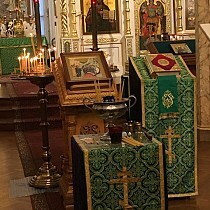 Praying in the altar was the First Hierarch of the Russian Church Abroad, Metropolitan Hilarion of Eastern America & New York. Singing at the services was the Synodal Choir under the direction of Peter Fekula. Many parishioners of parishes from New York City, Brooklyn and New Jersey were praying at the liturgy. Many of them received Christ’s Holy Mysteries. Addressing the faithful with a sermon upon the conclusion of the Liturgy, Fr. Tikhon expounded on the prescribed Gospel reading of the day: "After the Resurrection of Christ, the Gospel of John is read at Divine Liturgy, and after Pentecost other Gospels are read. Thus, throughout the liturgical circle, if a person goes to the services and listens attentively to what is read and sung, he can become acquainted with the Four Gospels ("Tetraevangelia"). Today, the deacon read a passage from the Gospel of Matthew, and we heard a part of the Sermon on the Mount. In His sermon, the Lord says: ‘The light of the body is the eye: if therefore thine eye be single, thy whole body shall be full of light’ (Matthew 6:22). We can learn a lot about a person by his appearance. It is no mistake that the eye is called the window of the soul, because through the eyes we can understand not only the mood of a person, but even his character. Sometimes they say that ‘he has an envious or lascivious look.’ By his appearance, one can understand how a person lives, what his emotions are, whether he is joyful or despondent. However, each of us intuitively understands that it is not in the eyes – they are just conductors, a mirror that shows what is happening in the human soul. "The Lord gives us this comparison to set our attention to those words that He intends to utter. He says that it is impossible to serve two masters, because man will love but one, and hate the other. If we think about our life, how do we live? It is good if we come to the temple one day a week, try to receive Communion, help the church – and dedicated our life to God. But can we admit to ourselves that our whole life is probably not completely devoted to God? Years ago, a priest answered this question for me: ‘When you find yourself outside the Church, you must correlate all of your deeds with this idea: God, do you like work that I am doing now? Is it holy?’ If we qualify our affairs with such a spiritual yardstick, then we will certainly begin to pray to God. If we approach our lives with prayer, then that prayer will protect us from unkind words and unclean thoughts… Thus, let us seek the Kingdom of Heaven, and the rest shall be added unto us." At the conclusion of Liturgy, a reception was held in the cathedral hall for clergy and parishioners where Archimandrite Chrysostom spoke on the missionary work of the Orthodox Church in Nigeria. 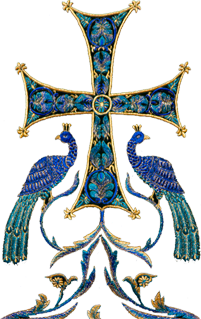 The Orthodox Mission in Nigeria was founded by Orthodox Greeks living in the country. One of the renowned Greeks in Nigeria, Anastasia Levintis, constructed the first Orthodox church in honor of the Resurrection of Christ. This church became the center of Orthodox life and missionary work for Nigeria and neighboring countries. The episcopal see in the country was established in 1997 and in October of 2004 was elevated to an archdiocese. The territory of the archdiocese encompasses Orthodox parishes in Nigeria, Niger, Benin, and Togo. Fr. Chrysostom brought with him books published by the Nigerian mission, which were on sale for those interested.